To continue keeping up a decent weekly mileage and having a day off I started Monday with a 7 mile run. It was very slow and I felt tired but my legs felt strong. I’m still getting used to having proper legs again and it was good to feel them NOT knocking into each other in a spindly style as I made my slow way along the seafront. I had already decided that this week I wouldn’t go to the gym as I think it is important to let my legs have time to reap the benefits which means not thrashing them in the gym every week (just thrashing them by running instead … ahem …). Of course as it was Monday I also had track to contend with in the evening. I joined my trusty band of running mates and thought I’d do my usual and try and follow Rick (I think he is fed up of this but hey ho). After a 1k warm up Bob set us off on 5 x 1300 with the first 1000 tempo with a wind up last 300. Arg! This was hard as long reps. I have no idea what speeds we were doing but I remained in about the same place each time and know that everyone (bar me) in the group is good at pacing so assume I was consistent enough throughout. A reasonable double day over all. On Tuesday I went to visit my old running friend Rob who has become a rampant gym goer whilst being injured. I joined him in his new habitat. It is sooooo modern compared with my gym! It had actual people in it too whereas mine tends to be emptier. Anyway I didn’t really do much as I was knackered after Monday but I did end up doing 5k on the treadmill after I had to leave the elliptical machine as I can’t coordinate my limbs for it. Wednesday was a long run. Well it was supposed to be but ended up being just over 10 miles. Not too bad though as I wanted to do well at the track 5000 on Thursday. My pace was very slow again as well which is fine for now as I’m just trying to get my weekly mileage back up to a decent number. 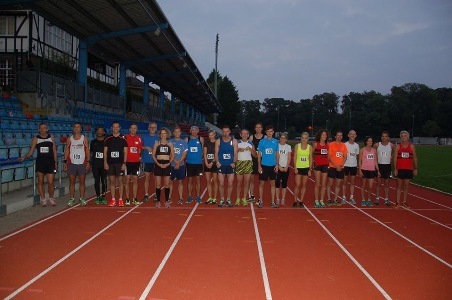 Thursday rolled around which meant it was time for Tom’s annual 5000 track race. I hadn’t even really thought about this and suddenly it was time. I did my shoelaces up a bit tighter as I think their looseness isn’t helping my dodgy calf/Achilles as I am probably scrunching my foot up a bit to hold shoe on (not that it would actually fall off). I felt good from the off and even overtook some people after about 1k as I knew I could go faster (usually I stay behind for fear of going to fast and dying later). Only one person re-overtook which I knew would happen anyway. Foolishly I hadn’t set my watch to beep at each k so I didn’t really know where I was but could see my average pace was 4.04 per k so this boded well for an acceptable time. Once I received the last lap shout (thank you Mr Cartledge) I did a traditional Muir wind up and windmill-sprint which brought me home in a quite unexpected 20.10. This was pleasing as my best run for ages. I had felt strong all the way in leg, mind and lung which is a rare occurrence indeed. 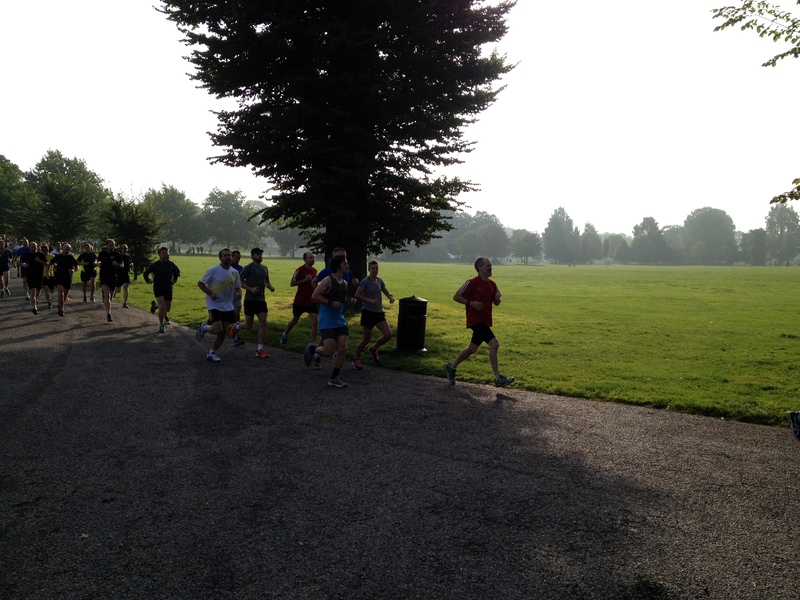 Today I ran Preston Park parkrun in 21.09. Was putting in a good effort but was unable to produce any speed. Pushing the invisible shopping trolley of slowness. Thanks Rob for the photo. Another Monday another trip to track. My plan this time was stick to Caroline as much as possible. This failed after the first 600 metres or so. The session was 5 x 600f, 100j, 400f, 100j, 200f (3 minutes rest between sets). Bob split me off from Caroline’s group as I was too slow so I was now in a group consisting of Trevor and I. This was good as Trevor dragged me along at a decent pace. Although I didn’t manage to do what I set out to do this was an excellent session thanks to Trevor pulling me along. Quite a lot of eyes shut running which is my gauge of effort. The more the eyes are shut the greater the effort. On Wednesday I needed to fit in a long run as I haven’t done one for ages. I plumped for a flat one as I had vet’s league T&F in the evening so wanted to keep as much leg strength as possible for that which meant no hills. I ended up only doing 10 miles but this was fine. It was a nice sunny day and not too windy so it was just nice to be out. In the evening it was Worthing’s turn to host vet’s league. This is basically school sports day for old folk. I love it soooooooooooooooooooooooo much. For once I can actually run for fun as people are always saying is the point. 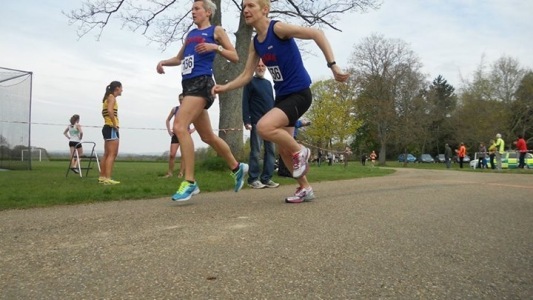 I love sprinting like an absolute windmilling buffoon and couldn’t care less where I come in any of the races as long as I know I had a jolly spiffing time. This outing I did the 200m (2nd place). 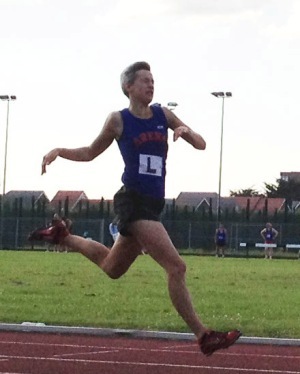 Followed by the 800 (650 jog, 150 sprint finish), then the long jump (3.96 best jump – not great but OK seeing as I had just finished the 800), then the 3000 that was basically a recovery/warm up jog before the 4×400 relay where I commandeered three B&Hers to make up a non scoring team. Obviously I loved all the sprinting and the long jump. The 400 was my favourite even though there was no-one to race (I was on last leg and the field was so spread out by then the person in front was about 100m away). I really enjoyed just hammering it round like a flappy armed goon. I have no idea of my times. I don’t think they were much good (I KNOW my 800 and 3000 were awful) but I couldn’t care less. I just LOVE these evenings and wish there were more than 3 or 4 a year. I must say thank you to Joe for driving us there and to Rob for helping me with my long jump run up and taking the exceedingly attractive photos showcased in this post. Having run and jumped mainly in spikes on Wednesday my calves were concrete on Thursday so I just took the Hove Park intervals session as a recovery jog. Rob was also broken from Wednesday so we hobbled round together at the speed of really slow people. I had planned to do 3 x King George VI hills on Friday but severe DOMS put paid to this idea so I decided a full rest day was a better idea. Even by Saturday I was still pretty much destroyed so Hove Park parkrun was yet another recovery jog. Rob joined me too along with Rick who has just completed an almighty cycle through some bits of Europe. He suggested we start from the absolute back and work our way through slowly so this is what we did. I think this run was most helpful for recovery as we wound it up slowly but surely romping home in just over 25 minutes. Another pretty poor week in terms of mileage (28) but a good test of being sensible as trying to run on DOMSy track death calves would have been very foolish. I have added to my arsenal of recovery tools. 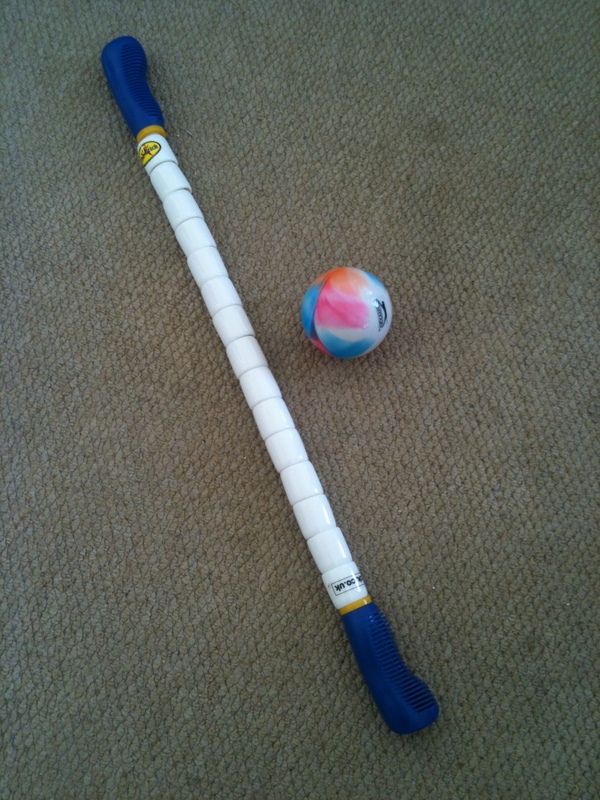 Hockey ball for soles of feet and hip/buttock poking and The Stick for all over rolling (much easier on the arms than the foam roller). This week I decided I would have a taper/rest week to allow the running holiday’s benefits to sink in so I rested on Monday as there was no track due to it being a bank holiday. 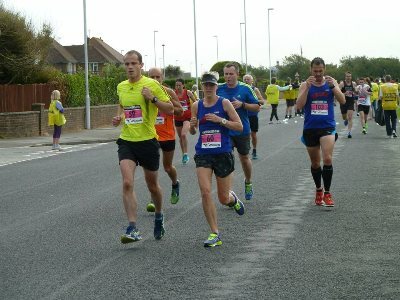 On Tuesday Rob and I decided to try a 10k tempo in preparation for Worthing 10k on Sunday. The plan was to run it in approximately 46 minutes, possibly throwing in a faster mile if we felt like it. This we duly did. I rested again on Wednesday as I was at work. I thought I should actually try and do Thursday’s Hove Park session properly having not done so for ages. 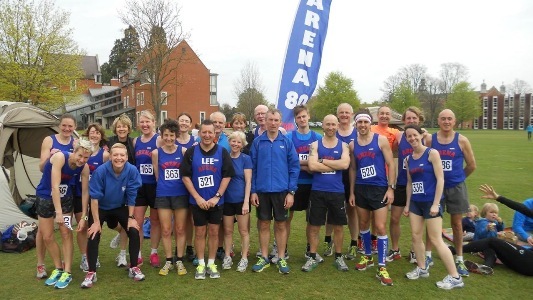 Bob had fashioned a session to suit the many Arena members who were to be running Worthing 10k on Sunday so I knew I must try as if I didn’t I’d only have to take myself out on Friday for mile reps or something which I would blatantly either not do at all or not do properly on my own. Thus I set off down the hill on the first, longest, rep around the far end of the park. It is unlikely I was going particularly speedily but at this stage I just want to practice actually running as well as I can at each session. The main bulk of the session was 5 x ever decreasing “laps” of the park. I made sure I put in the effort on each rep. It was easy to go out fast as the first 500 metres or so was downhill so it was just a case of keeping up the effort on the flat sections. We finished off with 2 x small downhill laps in the opposite direction. I was pleased with this session as I have finally managed to get myself to try. Long may it continue. Friday was a bouldering day so off I went to traumatise myself with heights once again. I managed not to snot all over myself in terror this week which is an improvement though I sweated like a lord on occasion and got stuck at the top a few times. I did however climb onto the duck though I did then have to slide along the top like some kind of deranged snake as I can’t stand on it and walk along like normal folk. I even sprinted up and down a couple of yellow routes though I couldn’t do my blue and white nemesis of old that I conquered. It has conquered me again. I think the trick is to conquer it then NEVER GO BACK. I have still not fallen off properly and the worst thing I did this time (in addition to scraping off much skin) was strain my armpit when failing the infernal previously-conquered blue and white. On Saturday it had been arranged that Arena would commandeer the volunteering at Preston Park parkrun. 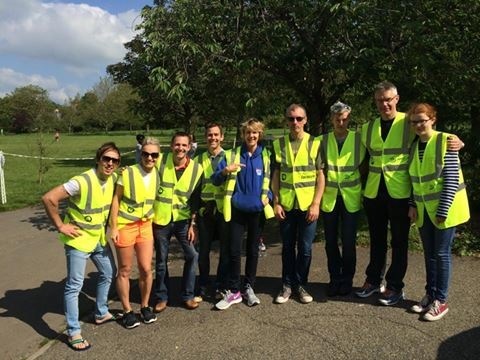 Thus a small group congregated to wear hi vis and generally be most helpful to the parkrunners of Preston Park. Luckily it was a perfect day for marshalling – sunny, warm and breezeless. I think a good time was had by all and as we have done our duty we can do many more parkruns without volunteer guilt (though I know we all volunteer regularly anyway). 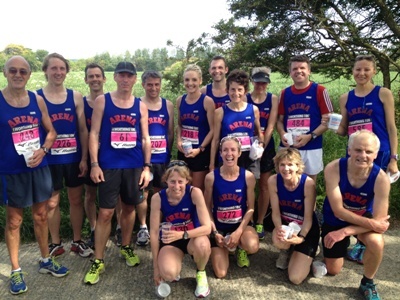 Then it was Sunday (today) which meant one thing: Worthing 10k! 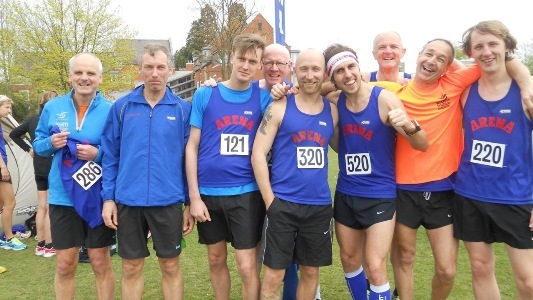 Last year this race was my one and only venture into sub 40 10k territory with a PB of 39.45. I knew this year there was no way in the world I would be getting anywhere near that time but I wanted to get as close to 42 as possible. I set my Garmin to beep if my pace got slower than 6.45 (I knew it would at some point) and decided to go out as hard as I could and see how far I got before the inevitable slowing down. Not very far as it turned out (not surprisingly). I haven’t done any training specifically for speed endurance. Everything has either been too long and way too slow or too short and fast. I hoped that the week away running hills etc would help but I think that just added to the category of too long and too slow. I set of what I felt was quite conservatively but reached 1 mile in 6.16. Dammit! I then slowed down a lot as I expected but managed to keep just under 7 minute miling with the help of my Garmin beeping to make me attempt to speed up slightly. 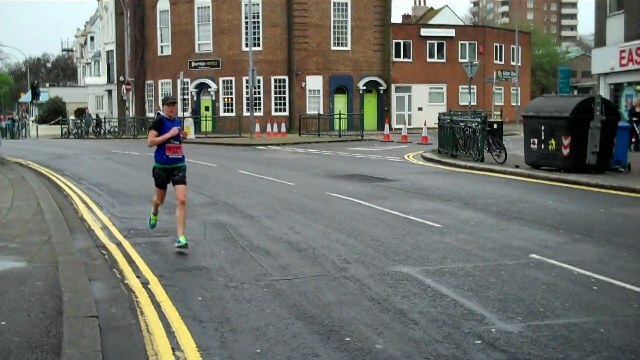 I hoped that the speedier first and second(ish) mile would keep me on for sub 42 even with the few lapses into being behind pace and this turned out to be the case as I crossed the line in 41.57 on the race clock. Luckily my chip time put me down for 41.52. Phew! Although this is of course still way off where I should be I definitely put in the effort so now it is just a case of getting my legs and lungs used to sustaining a faster pace for longer than a mile or so. Last year was no different in terms of effort but I was able to sustain the speed for the full distance. Anyway all in all I think this means I am over the hump and can now get back towards the speeds and times I feel I am capable of running. Hello there! Hope I didn’t surprise you posting on a Friday. This is because I am off on the annual Arena running holiday tomorrow. Somewhere in Somerset this time. Fingers crossed the weather shall be good and lots of running shall be done. Well of course lots of running shall be done even if the weather isn’t good. There is also a swimming pool, miniature golf, tennis courts etc where we are staying so hopefully much activity will be partaken in. Also lots of eating which is the most important thing I must do. Too thin, too weak. I MUST NOT kick a football though as that would totally destroy my ankle. I know I will accidentally though and it will be the most painful thing ever. Ho hum. Anyway, down to business, not that I have much to report. On Monday it was back to track. Today’s session was 7x1k – 200t, 300f, 200t, 300f 90s rest. Again this should have been a perfect session for me but alas I still struggled. I did feel like I was putting in the effort but nothing to show for it. I was way off the back of Mark and Duncan’s group but as it was stationary recovery I could at least regroup and start each rep with them. Still suffering effects of stupid depression which is most annoying as otherwise I’m not depressed and want to get on with it. Hmmm that made sense … I know what I meant anyway. Unfortunately there is nothing that can be done other than plough on and wait for it to lift. I didn’t plough on that much though as I only went to Core & Stretch on Tuesday. Still feeling tired after two long runs the preceding week. I need to get back on them as I shan’t stop feeling tired until I have incorporated them back into my running week. I’m still not sure how I managed to do two long runs, a 10 miler and everything else that I did last year. Now the mere thought of it exhausts me. Possibly somewhat due to accidental weight loss. I do definitely feel much weaker and that I have lost thigh muscle. Thus I am attempting to eat everything which Somerset shall help as chef Steve prepares loads of good stuff, along with all the mini pizza/fish finger sandwich/Pringles etc snackage. I intend to come back at least 20 stone, though I have just given away all my giant running clothes so will have to spill fulsomely from my smaller current garments. I did nothing on Wednesday which was down to Rob choosing B when I asked him to choose A, B or C without telling him which was which or indeed what it related to. For the record A – treadmill, B – rest, C – lsr. This did not help on Thursday when I went to Hove Park. I was still incapable of dragging anything from myself but at least as the session was 5×2 uphill half laps (should have been 6 but too slow to complete them all) I got some hills in. I was contemplating doing a lsr today but I shall be doing (at least) one a day from tomorrow so I don’t think it’s a great loss that I haven’t today. I had already planned to go climbing with Lydia anyway so it wasn’t a completely idle day. I managed to do a higher grade today though there are still some lower ones that I haven’t grasped yet and the duck still strikes fear into me. As I kept telling Lydia it would be fine if it had a nice banister running across the top. Climbing up and down the sides is fine I just hate cresting the top and then being on the platform. Weird also as it is the lowest wall. I managed to conquer the blue and white which means doing the splits (or it does the way I do it) but can’t do the one that means going round a corner. I did manage a yellow one which was pleasing but I still have uncontrollable miniature panic attacks from time to time and this was one time. After hyperventilating and snotting on the wall for a 30 seconds or so it passed but it is really most unhelpful when it is happening. Lydia even came up to try and rescue me but thankfully it had abated by then so I climbed down like a normo. Hopefully as I improve/continue these odd forays into abject terror will go away completely. Most humiliating. Only managed 10 miles so far this week but hopefully I’ll get stuck in to many long and hilly runs over the coming days to make up for it and to catapult me back into the swing of lots of lsrs as I used to do when I was briefly a good runner this time last year. Monday. Track. I was let off work not quite early enough to get home and then go to track so cycled straight there thus arriving over an hour early. I decided I might as well start running. 5 or so miles later a few people began to arrive so I continued my slow jog by-now-exceptionally-long warm up. By the time the session began I had already run over 6 miles. I was also very hungry. The session was 8 x 800, pyramiding from 300t, 500f down to 600t 200f and back up. This would usually be a good session for me but having done such and extensive and slow paced warm up I didn’t have any fast twitch in me and the session turned out to be a recovery jog/track session/long run. I wasn’t particularly bothered by this as by the end I had clocked up 11 miles. I had been testing a watch for work that was supposedly faulty (it wasn’t) so if nothing else it got a good workout. After Monday’s unintentional long run I wasn’t too worried that my next session would be a double day Thursday. Thus I set off in the morning for a medium distance slow run. It was fine, the weather was good, my pace was reasonably consistent and all was well. It was however very difficult to not go too far. I had an almighty battle with myself to stop at just over 9 miles rather than carrying on to around 13. I just about succeeded by reminding myself I wanted to do the evening session in Hove Park properly and this was less likely if I did a full lsr in the morning. I was glad of my hard fought victory come evening when we set off on 15 x Kenyan hills on the grass at Hove Park. This was followed by a downhill half lap with uphill grass sprint. Then 5 x uphill half laps. Luckily I had coincided with Duncan at this point so we were able to work together to keep going up the wiggly path and through to the end. We finished off with a fast downhill half lap and walked back up the grass to finish. 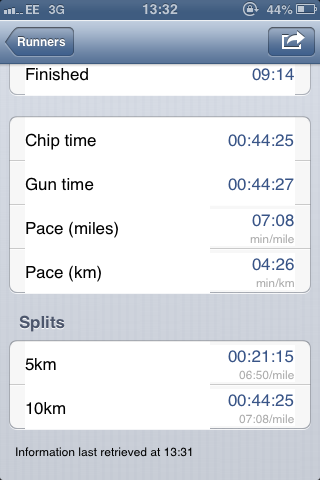 Over all this was a good session and I put the effort in which justified my shortish run in the morning. So I ended up running 13 miles for the day anyway, just in two distinctly different sections. On Saturday it was Preston Park parkrun’s anniversary so I cycled over in the hope of free cake and to applaud Duncan for being second in the men’s points competition. He was looking smart in a dress shirt and bow tie. I decided I would try and stick with him for the whole run this time rather than hoofing off way too fast then trying (and failing) to keep with him when he inevitably passed. This plan worked excellently up until 3k where we were on for 20.30. Alas I then just totally lost my motivation etc as usual and he continued onwards and I slowed down massively to drag home in a disappointing 21.10. Although that is probably about the best I’ve done recently. I know what I need to do to improve (other than a brain transplant). I must do some long tempo runs. At the moment I either do 8.30mm paced long runs or short fast stuff like track and HP intervals. I am sorely missing sustained tempo efforts which is what I need. As I have gold membership at my gym and hardly go there any more since starting work I have decided I must go there and do an enforced tempo speed run on the treadmill. Yes it is unutterably boring but I cannot be trusted to push myself or pace myself on the road so this is what I must do. Good for mental strength too. So off I set in filthsome weather to the gym this morning. I had a plan to do an hour of which 45 minutes would be at 13kmph at least. I set the treadmill to this speed to see what it felt like (treadmill on 2% incline as usual). It felt fine so I immediately changed my plan and decided after a few k at this speed to put it up to 15kmph (20 minute 5k pace) and see how long I could last. I wasn’t that surprised to discover I managed 6k. No matter how much I do actually trust myself that almost everything to do with my recent crapness is brain-related I still chose to believe that it might be something to do with my ankle. This however shows I can do it if the pace is enforced. I know treadmill is not like real running but at least my limbs can move fast enough and my lungs can hack it (didn’t even inhale which would have been a definite no a while ago). Hopefully now I’ve done this I might be able to keep myself going past 3k at the next parkrun. I doubt it though as I know I just can’t care and drag out any form of motivation currently. I shall take a day off tomorrow I think after a 34 mile week with a good mix of speed, hills and long stuff. Sorry, this post starts as always with Monday’s track session. I was still suffering from whatever the heck was wrong with me on Sunday so embarked upon Monday’s track session without my usual enthusiasm (if I can’t drum up interest for track then something is seriously amiss). The session should have suited me down to the ground as it was 10 x 300f, 100j 200f but I knew I wasn’t up for it so stuck with Duncan as much as possible as I knew then I would at least get in a good, consistent, well paced session. If there was ever such a thing as a recovery track session this was it (also I had nothing to actually recover from). Alas I was working on Tuesday so yet again I couldn’t go to Core & Stretch. I can feel my core stretching (and not in a good way) as I type. 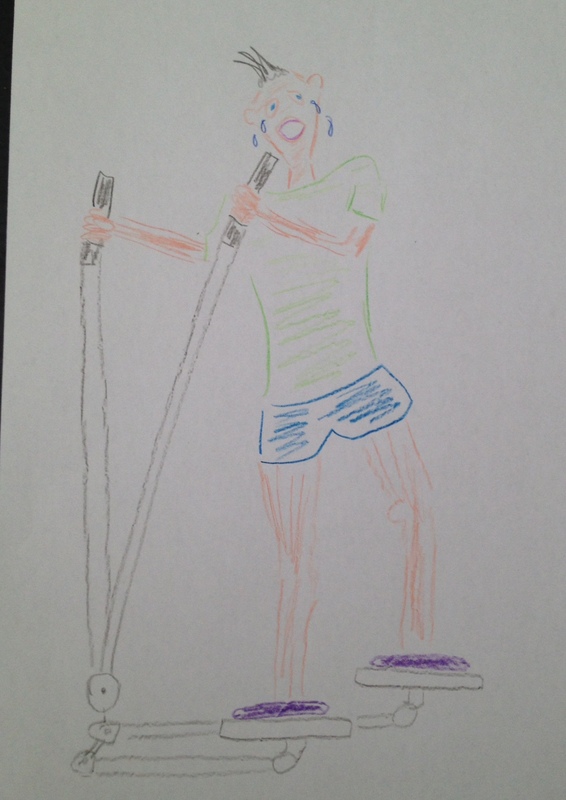 I planned to do an LSR on Wednesday but was assailed by the inability to do anything at all. I even forgot to buy spinach. A day best forgotten. On Thursday whatever fog had descended in the preceding days had lifted so I set off on a nice long run of 14 miles. The weather was nice and sunny and not too windy so it was an excellent run apart from a small section where I had to run through the main Brighton seafront bit. Gah! I always make this mistake the first few times it is sunny and vaguely warm. I managed to keep my pavement rage to a minimum and vowed not to make this mistake again (even though obviously I will). Even with this slight obstacle the run was pretty well paced for me. The extra day’s rest and having not actually done anything hard for a while this run felt easier than normal along with the all encompassing gloom having left (in fact this was the main factor). As I hadn’t done a long run for a while I thought I should do a recovery run on Friday knowing that I had Christ’s Hospital Relays on Saturday. Thus I ran 3.5 miles nice and slowly. On Saturday morning I watched the Brighton Marathon highlights programme and spotted Rob and I behind some woman called Paula Radcliffe who seemed to be being interviewed and photographed for some reason. 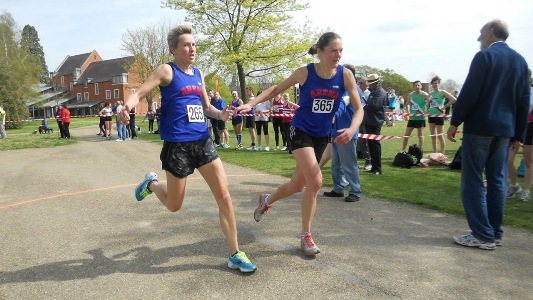 I love Christ’s Hospital Relays as each leg is a mere 2.1 miles and the course is flat and road. This is always one of my top 3 races of the year. A great day out. This year didn’t disappoint. The weather was warm(ish) and dry and not too windy so I was looking forward to putting in a good run as I knew I was in the right frame of mind to get on with it and run well. I even did the full lap as a warm up when usually I bail out after about 500m. I was on first leg for the senior B team and then second leg for the non scoring team. This meant I would have to finish pretty speedily to have time to swap numbers and take over from Fiona who is in no way slow. I think this added pressure helped me speed off like an absolute maniac (no change there) and reached 1 mile in 6.20. Ooops. I continued however and kept the effort up but due to windiness and the inevitable slowing down the second mile was 6.52. Hmmmmm what a surprise, me doing some bad pacing. Anyway I finished my first leg and set Fiona C and Rob to work changing my number over as my fingers never work post run. This complete I had around 20 seconds before Fiona J arrived and I was off on my second leg. I was somewhat pooped ‘tis fair to say. However I was pleased to reach 1 mile in 6.52 and managed to hold the pace reasonably well for a 7.08 second mile. It seems consistency can be found when I start knackered. I was pleased with my first leg time of 13.28 (although I know I should be sub 13 really) having not run anything even vaguely speedily for a long time and thought my second leg time of 14.22 was OK too considering the miniscule recovery time and stabbing myself panic stricken whilst trying to swap numbers. I was pleased that my two legs were out of the way within half an hour and I could then relax and watch the senior men’s race. The day was as excellent as I had hoped. We had a good Arena contingent out as usual and it is good to watch people running who I don’t usually see as they are many miles ahead of me. An excellent finish to the week after an awful start. Having had a good track session in Duncan’s group last week I thought I would go with him again this week, I’m nowhere near in the right shape to stick with the faster group at the moment. This turned out to be an excellent decision as the first part of the session was a timed 1k, something which I would not pace well if left to my own devices. Duncan took us smoothly round in 4.12. 3 x 300 metres later then it was a run-as-far-as-you-can in 4.12 the idea being we should get well past 1k. We managed round 1125m thanks again to Duncan’s pacing. Another 3 x 300 then disaster! Duncan had to pull out as he had a crampy calf. That meant that only Rob and I remained. Of the two of us I am the better pacer (oh dear God). Thus I decided to take the reins and attempt to pace us on the second run-as-far-as-you-can in 4.12. We are both the masters of inconsistent pacing and giving up too easily so it was actually good for me to take up pacing duties as I couldn’t give up and had to be vaguely sensible to try and help Rob. I think it was OK, it felt reasonably fast but even (ish) paced and Rob zoomed past me at the end as he was in charge of timing the 4.12. We went about 1100m this time which was good for our second go and with only my nowhere-near-Duncanesque pacing. 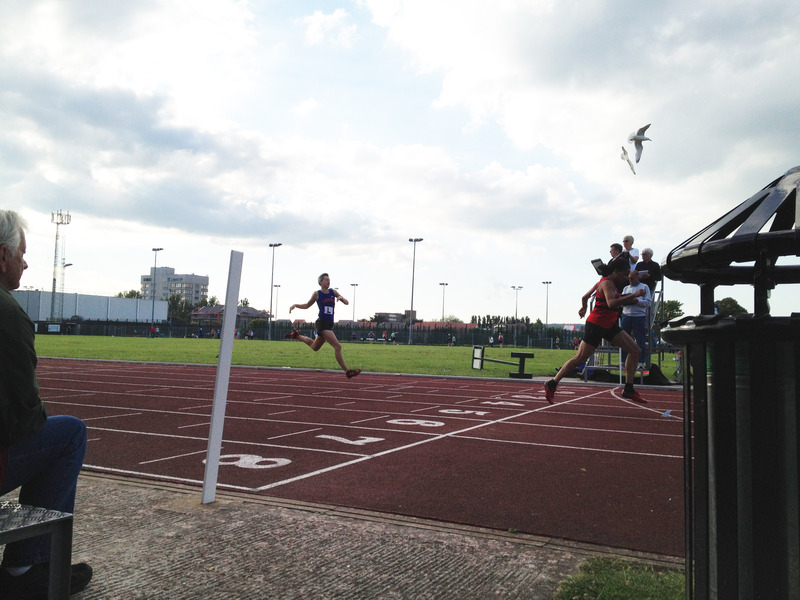 As Rob had beaten me in the 4.12 he was to set off 50 m ahead of me and I had to attempt to chase him down. I knew this was doomed as he will always be able to outsprint me as soon as I get anywhere near him and this was indeed the case. In the end he stopped as 600m of this nonsense was plenty as an end to a good session. As I had arrived ridiculously early having come straight from work I ended up doing 8 miles for the evening. The session was excellent though and I was very pleased with my work rate and effort and dragging along of Rob. He worked v hard too which is good as we hope to get down to sub 20 minute parkrunning soon. On Tuesday I was able to go to Core & Stretch having not been for three weeks. I could definitely tell! Good to be there though. Unfortunately I can’t go again this week but soon I should have Tuesdays off so I can get back to going weekly. On Wednesday it was the last Prom Run of the winter season so I decided to join the posse as I thought I could throw in a few fast sections to check out my possible shape for Sunday’s 10k. I dragged Rob along with me (poor man). We managed an almost-mile at 7mm pace then I charged off on a kilometre section where I managed 6.20-6.10 mm pace. This was pleasing though of course I know I couldn’t keep it up for more than a mile at the moment but good to know I can still do it. A solid 7.5 miles for the bank. On Thursday I went to HP. This was a mistake as I was totally knackered from hard runs on Sunday, Monday and Wednesday. Sensibility fail though I hadn’t really considered the possibility that I would be tired. Almost immediately I realised the futility of attempting to do the session properly so turned it into a recovery jog with walk sections. Only 4 miles so acceptable as a recovery run. On Saturday I went to Preston park for parkrun as it was Jacko’s 100th run. The park was gearing up for the Brighton Marathon Mini Mile races so it was interesting to run the course surrounded by barriers and people testing PA systems etc. I was only ever going to take this run easy and jogged home in just under 23 minutes. I hoped this would mean I could do well on Sunday even though I knew really that I wouldn’t as I just don’t really care about racing at the moment. Anyway I set off too fast as usual and did the first 3 miles in 6.30, 6.40 and 6.59. I then slowed down massively and crawled home in 44.28 which is truly awful. There is no reason for this other than I don’t have any motivation or interest in racing at the moment. It was a shame as the course was good. Wide, empty and plenty of space. Ummmm where are the other 1399 runners? Although I actually walked across the line and was utterly unimpressed with myself I was just happy to have got the run done and am not dwelling on it as I would have done in the past. I was crap. The End. At least having finished at the marathon finish we were able to easily mosey over and watch the marathoners running up St James’ Street then coming back from Rottingdeanwards at around 12 miles. Rob managed to photo a few Arenas who were all looking strong. I then walked home all the way along the route to 16 miles where I turned off to confront an ambulance and collapsed runner. There are probably still people out there now but alas I cannot see through the buildings opposite. I know that I shall be cycling through a sea of water bottles and gel wrappers tomorrow though. Actually last year the road sweepers did a good job of unwelding all the detritus and I’m sure they will do the same again this year.